It has happened. The New York Mets have made a trade, acquiring infielders Juan Uribe and Kelly Johnson along with cash considerations from the Braves for two minor league pitching prospects, John Gant and Rob Whalen. Uribe and Johnson who are both having solid years will have an immediate impact on the Mets pathetic and malnourished lineup. Uribe, 36, is having a solid year with stops with the Dodgers and Braves, hitting .272 with a .331 OBP, 8 home runs and 23 RBI. Uribe is kind of like the position player version of Bartolo Colon, no matter how old he gets he just keeps trucking along. 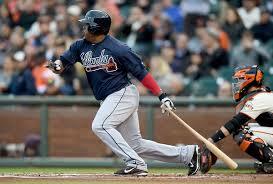 He has World Series experience with the Giants and White Sox and is known as a tremendous clubhouse presence. Uribe will likely play third base in New York for the foreseeable future. Uribe has played just six innings away from the hot corner since 2013. Kelly Johnson will hope his second stint in New York will turn out better than his first one when he badly struggled with the Yankees in 2014 and was flipped in a deadline deal to the Red Sox. Johnson, 33, has traveled a ton over the last year. The Mets will be Johnson’s fifth team since the start of the 2014 season. He is having a bounce back year as Johnson is batting .275 with 9 dingers and 34 RBI despite only having 182 at bats in 2015. Johnson now leads the Mets in batting average and slugging percentage. He can play all over the diamond as he has played both corner infield and outfield spots this season along with second base. This allows Terry Collins to have something he hasn’t had in sometime as manager of the Mets which is flexibility. Collins can put Johnson all over the field. With Uribe now at third, Daniel Murphy will likely shift back to second. That means one of Wilmer Flores and Ruben Tejada will have to sit most nights before even considering where to put Johnson. If Murphy and Lucas Duda continue to struggle perhaps Johnson can steal playing time away from one of them. The Mets hitters are now no longer guaranteed to play everyday. The Mets are not ruling out making another deadline move with nearly a week still to go before the trade deadline. Do you like the Mets trade deadline acquisitions? Jacob deGrom has been even better than he was in his 2014 NL Rookie of the Year campaign. He has been the ace of one of the better pitching staffs in major league baseball. 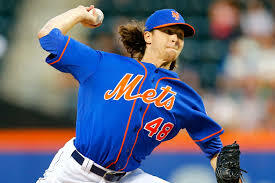 As a shortstop up until college, there is little mileage on deGrom’s arm. 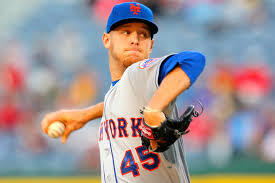 From a Mets perspective it makes too much sense to lock up the 27-year old to a long term deal this winter. The Mets have assembled one of the greatest young rotations in franchise history in deGrom, Matt Harvey, Noah Syndergaard, Steven Matz and eventually Zack Wheeler. Unfortunately they will not be able to keep all that talent unless they either double their payroll (a joke) or start trying to lock these guys up now before they start going to arbitration. The Mets lone 2015 All-Star won’t be a free agent until after the 2020 season but the name of the game here is cost control. It’s important to look at this from both sides here. Obviously the Mets want to keep all of their young talent as long as they can but from Jacob’s standpoint he was a 9th round pick in 2010 so he wasn’t exactly a bonus baby. Jacob is making just 557K this season so a deal that gives him financial security for life would have to appeal to him more than a guy like Matt Harvey, who will begin going through arbitration this winter. A deal similar to what Julio Teheran got from the Braves a few winters ago, 6-yrs $32.4M with a team option for a 7th year would make a lot of sense on both sides. The Mets would keep deGrom throughout his whole prime on a cost controlled deal and deGrom would have financial security. The Mets will have to be creative with moves like this if they have any hope to keep their super rotation long term. If the Mets aren’t going to be spending much money on free agents then they should at least be signing their own players. Definitely something to keep an eye on this winter. After the most impressive road trip of the 2015 Mets season, optimism surrounds the Mets as they head towards their final series of the first half. So the question Met fans are asking now is what next? Well next should be Sandy Alderson going out and acquiring a bat. We have already speculated here on BrokeMets how great a fit Ben Zobrist would be for the Mets. Zobrist is going to have a ton of interest and could fit a number of teams but he isn’t the only option that would help the Mets without costing them all that much financially. The Mets should call the Milwaukee Brewers to discuss one of their outfielders. 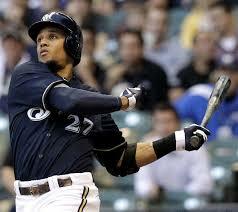 Former Met Carlos Gomez along with gold glove outfielder Gerardo Parra are available in trades. Neither is making all that much money compared to other outfielders who could be on the move in a couple weeks. Parra, 28, is set to be a free agent after the season so the 37-50 Brewers will surely trade him. Parra is hitting a career best .309 with eight homers and 40 runs scored in 84 games for the Brew Crew this season. Parra would fit the Mets perfectly because he can play all three outfield positions, he is only making $6.2M this season and most importantly he could be the Mets first legit leadoff hitter since Jose Reyes. In 18 games in the leadoff spot this season Parra is hitting .380 with a .407 OBP. Parra is a gold glove outfielder in all three outfield positions and is an upgrade offensively over all of the Mets current outfielders. The Mets have had interest in Parra in the past when he was a Diamondback. 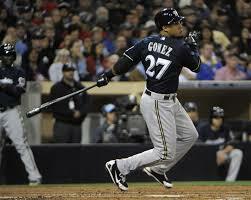 Parra as a rental wouldn’t cost the Mets a top arm unlike Carlos Gomez who is also available for the right price. Gomez, 29, was the key piece that sent Johan Santana from the Twins to the Mets back in 2008. After leaving Minnesota, Gomez figured it all out to become an all-around star. He is having a down year due to a bad April but he is a great centerfielder with two tools the Mets don’t possess much of right now, power and speed. He could take the Mets to a whole other level and like Parra could also leadoff if needed. Gomez is on a very team friendly contract making $8M this season and $9M next season before becoming a free agent. With his very inexpensive deal, expect the Brewers to ask for a haul for their 2-time All-Star so it remains to be seen if the Mets could reacquire Gomez without giving up one of their top flight pitchers, which they are unwilling to do. 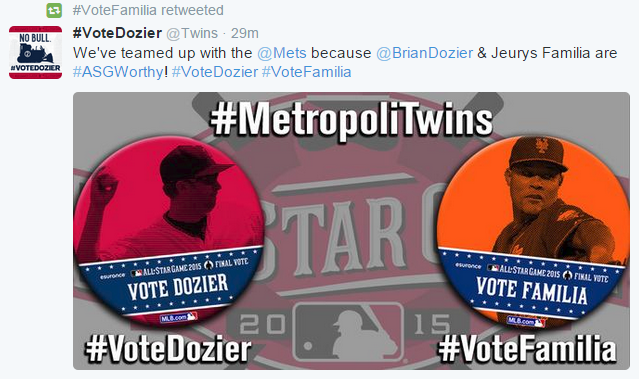 Parra or Gomez would be tremendous fits for the Mets. Neither is making much money and both are available now for the right price. Alderson should be calling Doug Melvin in Milwaukee immediately. After an amazing first half Jacob deGrom has made the NL All-Star team. 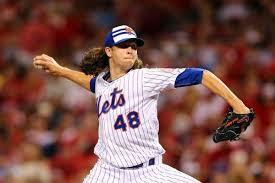 deGrom has been truly dominant and has become one of the most unlikely stars in New York Mets history. A 9th round pick out of Stetson University who mostly played shortstop in college is having one of the better seasons a Met pitcher has ever had. deGrom, 27, is 8-6 with a 2.30 ERA on the season. He has allowed just 82 hits in 105.2 IP and has a WHIP of under 1.00. His FIP of 2.76 (Fielding Independent Pitching) shows that he hasn’t really been lucky this season and is unlikely to regress much in the second half. deGrom truly earned this honor and wasn’t selected just to give the Mets a representative. Jake was voted on by the players not Bruce Bochy the NL Manager. It just shows you how truly dominant his peers think he is. deGrom will face Bochy’s Giants Wednesday afternoon. deGrom is 4-1 with a 1.30 ERA in six day starts this season. Jeurys Familia also deserved to make the team but with so many great closers in the NL along with the fact that every team needs to be represented kept the Mets 9th inning man off the roster… For now. Familia was put on the Final Ballot along with 2014 NL MVP Clayton Kershaw and the All-Star Game hometown star Johnny Cueto. As a Met fan it is a little disappointing to see Familia’s tremendous first half not be rewarded with a roster spot. Familia has a 1.13 ERA and 23 saves but Cueto is more of the travesty. He has is having another tremendous year and his club (for the moment) is hosting the All-Star festivities. Even if Familia doesn’t win the Final Vote he still has a very solid chance to make the All-Star team if someone gets hurt. These rosters will change, they always do. A case could be made that other than Trevor Rosenthal, Familia has been the best closer in the NL. The flamethrower has allowed just five earned runs all season. Familia must have caught the attention of Bruce Bochy who admitted it was very difficult to keep him off the roster. Familia may have had his best outing of the season Monday night in Bruce Bochy’s home ballpark during the Mets 3-0 win over the Giants. If you haven’t noticed, the Mets are in a tailspin. The Nationals are running away with the NL East and the Mets at the halfway mark of the season are at 41-40. They are entering the toughest part of their schedule that will see them continue on the dreaded West Coast Trip against two World Series contenders, finishing the series with the Dodgers and then the Giants. Unlike Willie Randolph a few years back, you should expect Terry Collins to make it back from this difficult West Coast trip but Collins doesn’t exactly have a long leash. If Terry goes, Sandy should follow him out the door. Sandy Alderson was brought in here because the Wilpon’s have no interest or ability to add payroll. They felt that a baseball man like Alderson who had experience running low budget teams like the A’s and the Padres would do just fine with their situation. Whether that was right or wrong Alderson accepted the challenge. His plan was simple, wait out some of the Mets bad contracts and develop the Mets minor league system. He has done a fine job of that as baseball considers the Mets having a top five farm system, headlined by 2014 first round pick Michael Conforto. The outfielder is blazing through the minor leagues and should be considered for Triple A, if not the big leagues pretty soon. Having said that, Alderson hasn’t done much else besides that improved system. When you are a small payroll team (no question the Mets are now) you have to develop your minor league system and then lock up your young stars before they get expensive. Alderson hasn’t attempted to lock up any of the Mets young pitchers to date. He’s running out of time to do so as some of them begin arbitration this winter. Alderson’s lack of urgency on seemingly everything is very alarming. 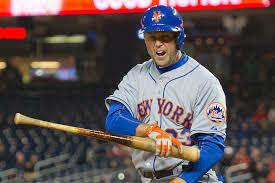 He called the Mets beat reporters and fans the citizens of “Panic City” when he was questioned about his lack of movement this week while the team continues to free fall. Alderson continues to alienate the fans as if its his job. The comments joking about the franchise such as “what outfield?” and “the Mets only reimburse gas at a downhill rate” continue to make fans irate. Most of Alderson’s jokes have been about the teams finances and with a passionate fan base that is having trouble seeing the light at the end of the tunnel, it is difficult to understand why Alderson continues to “poke the bear”. The Mets currently have the 21st highest payroll in the sport so it’s not like they are completely without resources to use. All of the big contracts Sandy Alderson has brought in as GM of the Mets have been poorly spent or worse. The two most expensive deals Sandy Alderson has made in free agency are currently playing corner outfield for the Amazins. Curtis Granderson has batted .235/.333/.403 in 236 games as a Met. He has been incredibly streaky and his outfield defense has declined over the past few seasons. The Mets have bigger problems than Granderson but he hasn’t been worth the 4-year $60 million contract he received. While Marlon Byrd was a good pickup a few years back, but he wasn’t brought back for Chris Young who was a very regrettable signing by Alderson. Alderson has spent the rest of his small budgets on bullpens. All of the relievers brought in by Alderson on major league deals haven’t worked out. Players like Frank Francisco, Jon Rauch, D.J. Carrasco all performed very poorly when brought in by the Mets. Alderson and company have flat out been too patient to help this team be successful. Besides letting a potential playoff team die without any reinforcements in ’15, the team also took far too long assessing their own players. The Lucas Duda–Ike Davis dilemma took far too long causing the Mets to be unable to get anything of value for Davis. The same situation occurred with Dillon Gee who is being paid $5.3M to pitch in Las Vegas. His decision to keep Wilmer Flores at shortstop as long as they did remains a head scratcher. 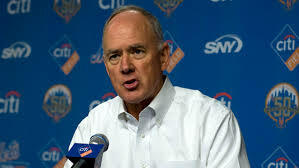 With the Mets falling out of the race quickly, Sandy Alderson had to do something bold. He could have traded a few lesser prospects to get Ben Zobrist or even called up his own uber prospect Conforto, instead he and his staff just sat on their hands, leaving this team to figure something out themselves. If anyone should be on the hot seat its Sandy not Terry.